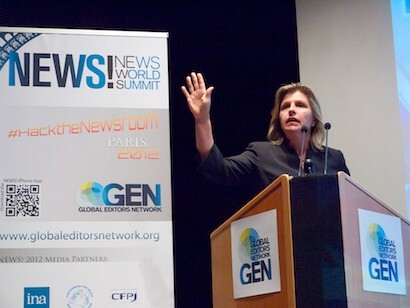 Newsrooms should make substantial changes to their workplace culture and workers’ rights to attract more women to journalism and encourage them to take up management jobs, senior editors at the News World Summit in Paris have suggested. The discussion, on how to get more women into senior journalism jobs, came after the International Women’s Media Foundation surveyed 500 media organisations in 59 countries and found 27 per cent of top management positions are held by women. When I joined this business 30 years ago, I never thought 30 years later I still had to answer this question. I do think that women, generally speaking, do bring a different style of management, as they have brought a lot of different things to journalism. The massive numbers of women joining this profession has I think made a difference in the kind of journalism we are publishing or broadcasting. I think basically more female leaders attract more female readers or viewers – it’s as simple as this. One of the ambiguities of this campaign was it didn’t define what was a leadership position. We are already at 30 per cent but we are surprised because we think it’s not enough. I counted how many editor in chief women there were in Morocco. I found seven out of 47 people in that job title – that’s two less than last year. They left because they got married. So what can be done? Here are three of the ideas that came out of the panel debate. I think it’s very important to consider how we depict women in the media. If you look at a front page, I think you should see at least one woman depicted there or talked about and it shouldn’t always Angela Merkel. I really do believe that having sources quoted as women – people on television in positions of power being women – it sends its own message. There has to be a possibility to combine working life with family life. They (colleagues at the last paper he worked at) thought that to be editor of a newspaper you had to work long hours every day. They did this because their wives picked up the children. I said to these guys: this is not working because the signal we are sending out to journalists is that if you are going to have kids and you have a man who has a job, then you can’t be an editorial leader. When it comes to staffing a position that’s really strategically important and I’m looking at a female candidate in her thirties, the question of course is how long will she stay. I’m genuinely happy when any of my colleagues has babies. German law incentivises fathers [to take more time off]. The risk now is evenly spread when I look at young men and young women; the risk is pretty much the same, that he or she will take off for the year. The law can do wonders. This entry was posted in Journalism and tagged #gen2012, Global Editors Network, News World Summit, Women in journalism on May 31, 2012 by Paul McNally. A new HTML5-based service that aims to “connect” magazine readers – allowing them to share, recommend and comment on what they’re reading with like-minded people – has been showcased at the News World Summit in Paris. Netizine is in invited beta mode at the moment and aims to “turn magazines into social networks”, building communities around content and bring interactivity to magazine pages. Readers interested in the same subject can chat about articles on the page itself and join groups around specific topics. Editorial teams would also be able to connect with readers in real time. Magazines can be personalised and bookmarked to read offline – and Facebook and Twitter are integrated directly into each page. There’s a video explaining more about the service on the Netizine website. This entry was posted in Magazines and tagged #gen2012, Global Editors Network, html5, Magazines, Netizine, News World Summit on May 31, 2012 by Paul McNally. 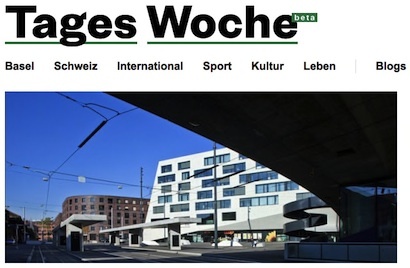 The blogs editor of a new Swiss weekly newspaper and website that required all of its senior staff to join Twitter says the move has helped them better understand the challenges of multi-platform publishing and engage with readers. Tageswoche launched in October – and had 3,000 people buying a subscription “before they even knew what it was about”, David Bauer told the News World Summit in Paris today. It’s difficult to get into journalists’ minds that they’re working on a story without knowing where it’s going to be published. Up until recently it wasn’t common in Switzerland for journalists to be on Twitter. We forced all our editors to join Twitter – it teaches you about pace, about interaction, about information flows, about making mistakes and being open about them. The one thing that surprised me and astonished me the most was the great quality of user content. We required everyone to sign up to post a comment, keeping out the trolls. We actively and prominently featured good reader comments, thus setting a bar. Our editors actively engage in discussions about their own articles, be it on Facebook, Twitter or our website. We had to learn the hard way. We didn’t have a native app – we just had a website that was optimised for mobile devices. But what happened was people went to the App Store, didn’t find us and concluded that it didn’t exist. A lot of people told us that we need to have more news on our website but when we look at what articles people read and share the most it’s when we go beyond news, comment on news, add background information and explain the news. We curate a lot, send people away, and have them come back to have the news explained by us. This entry was posted in Journalism, Online Journalism and tagged #gen2012, Global Editors Network, News World Summit, TagesWoche, Twitter on May 30, 2012 by Paul McNally.